The Original Baker River Regatta! 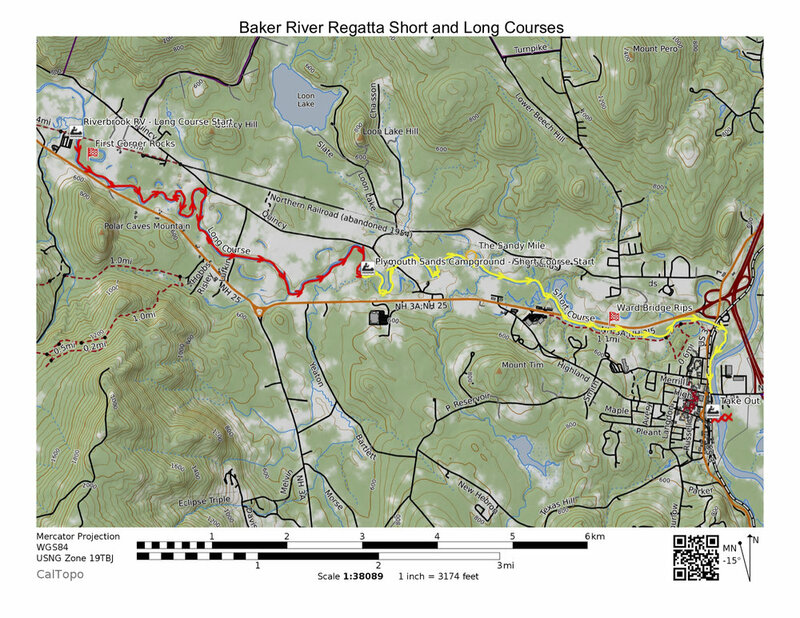 The 4.5 mile Short Course starts at Plymouth Sands Campground (just upstream of Smith Bridge) and finishes on the Pemigewasset River underneath the Dicenzo (Route 175A) bridge (yellow line). Watercraft must be taken out a hundred yards farther downstream, on the right bank, at the Rotary Amphitheater boat ramp. The short course is well suited to novice paddlers, consisting of quickwater, corners and a few fast riffles. There also will be a few branches and leaning trees to avoid in the corners, and a handful of rocks here and there. Expected times for novices on this course are 40-60 minutes. Racers paddle against the clock, with 3-4 boats starting per minute. The short course will have a class for just about any combination of paddler and craft, and is the course for entrants in the Most Trash Picked Up class. Unlimited: nearly anything goes! War canoe? Rowing shell? Canoe with kayak paddles? Poling? Must be human powered and adhere to general race safety rules. Race director’s decisions are final. Buck-Fifty Class: Two paddlers in one canoe, whose total combined ages are 150+. These paddlers pay nothing. Free!